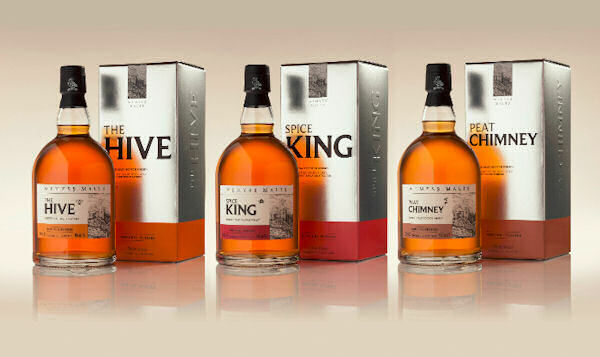 Wemyss Malts are delighted to announce that their award-winning blended malts portfolio; The Hive, Spice King and Peat Chimney, is evolving following the success of last year's limited edition, Velvet Fig. These whiskies are now available as no age statement lines bottled at 46% abv, non chill-filtered and presented in gift packaging. The Wemyss blended malts are named after each whisky's natural flavours and aromas taking you on a journey through the regions of whisky making in Scotland. The Hive, with its signature malt from Speyside, is heavy with the scent of floral orange blossom and honeyed notes. A tingling spice dances over the tongue, a citrus juiciness lingers with a whisper of applewood smoke. Spice King has a sweet spicy character that is true of the Highlands and Islands region. It slowly develops revealing stewed plums and raisins followed by a hot pepper prickle buffeted by coastal sea spray. A subtle smokiness is left smouldering. Peat Chimney is reminiscent of standing on the seashore on Islay with citrus, salt and smoky notes at the fore. A sweet smoke slowly sizzles to a softer finale. As part of this review, recognising the global shortage of aged Scotch whisky, Wemyss Malts will be discontinuing the 8 years old bended malt range, while the 12 years old range will continue on a limited basis. William Wemyss, Managing Director of Wemyss Malts, commented: “Velvet Fig was our first blended malt foray into higher strength and non chill-filtered bottlings and the reception from our customers was extremely positive. Consequently, we felt that the time was right to move our core expressions of The Hive, Spice King and Peat Chimney in the same direction."